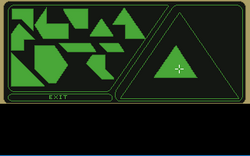 I've been meaning to do this project like this for a while, but I just found Jerrot's verb bar template and, since I'm in the coding spirit, I figured now's a great time to do it. 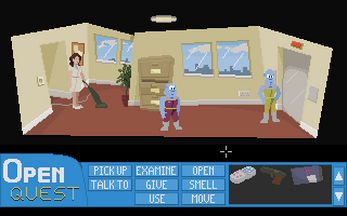 DFAF Adventure is an attempt at making a comedic point and click graphic adventure game featuring people from the Double Fine Action Forums. It's in the really early stages (at this moment all that's in there is one conversation and a temporary ending to make it playable. But, I thought I'd make (somewhat) daily builds of this so people can try it as it's being made. Funny and awesome to see some 13y old demo script lines of mine (which never got updated) to be used in a project! On github you state that the verbbar has no license, which is true due to its demo script nature. Just in case - if you need some valid license at some point, I'd happily redistribute it under MIT license. Can't check out the game itself right now, but thanks for sharing already. It's a really useful and awesome template. I only had to add a mode to disable the verb bar for cutscenes, and, of course the code for the additional verbs (and I went a slightly different route for the conversations). The rest worked perfectly. If you'd like to, that'd be great. But, it's not necessary. I dove into the DFAF adventure game head first without knowing much about Wintermute, so I decided to get my feet wet a different way. I adapted the open source AGS game OpenQuest to Wintermute. 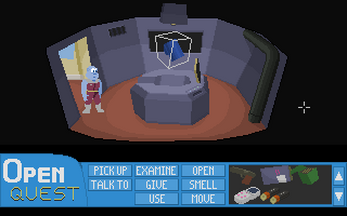 Since there's a lot going on in that game, despite being only two rooms, I was able to learn a lot about the engine. I'm going to add the things I learned (especially that I forgot to update the menu code for the low resolution - oops) into the other games I'm working on. The Wintermute conversion of OpenQuest is 300x200 like the original, and is available here, and the source is available here. The only thing that's missing in the game is the triangle puzzle (you move pieces in the right order to form a triangle), which might be beyond my ability. I'm going to give it a shot, but it's playable without it (and the SCUMM conversion actually skipped this puzzle as well). EDIT: The information on this forum is awesome. I found this topic, which is exactly what I need for the triangle puzzle. Now it's not impossible, just time consuming. EDIT 2: The triangle puzzle is now in the game. 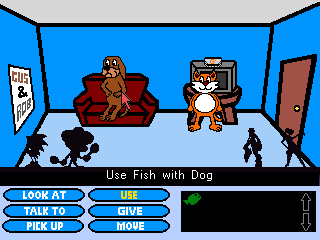 I created The Dreamcat Adventure, a small one room adventure game that I'm also writing a guide for - so that anyone who wants to make low resolution games with a verb bar in Wintermute can do so with the guide and Dreamcat as a template. I put the stuff I learned into The Dreamcat Adventure and DFAF Adventure, plus I've been in the mood to create music - so I made a few new songs for those games (and resurrected two I made in 2013 for February Album Writing Month for Dreamcat).